School employees were caught on video forcing open a bathroom stall that a transgender student was using. 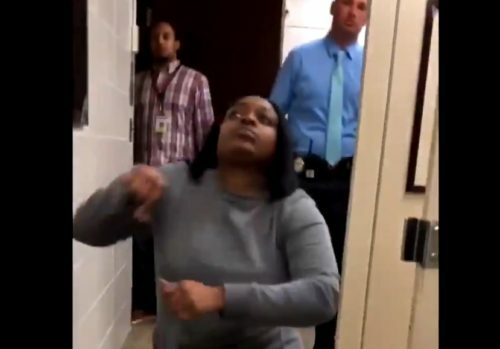 The video, obtained and shared by Kenidra Woods on Twitter, shows a transgender teen using the bathroom while school employees at Osseo Senior High School in Minnesota try to get her out of the stall. They reach over the stall door with a stick and use it to open the door’s latch. Two men and a woman can be seen as the door opens. The student posted the video to Facebook, although local media is not reporting her name because she is a minor. The video was then shared on Twitter by Woods. A girl who says she’s the trans student’s sister posted several messages to Facebook about the incident, using “he” pronouns to refer to her sister. The school has not commented on the video.